Featured at Romance Reviews Today Blog! Check it out! I've been interviewed over at the Romance Reviews Today Blog! I have to say a big thank you again to Patti for the interview! Yesterday, I received a fantastic review from Frost at Two Lips Reviews, for Twilight's Kiss. It was given the highest rating of FIVE LIPS! Here's a snippet of the review and I'll include the link so you could read the full review at Two Lips Reviews! Twilight's Kiss is a delightful and satisfying paranormal romance with intriguing and unexpected veins of paranormal elements woven in. Deep in rich descriptive background, the novel entices and enthralls its readers. The characters are fully delineated, even to many of the secondary ones. A strong-willed and independent heroine matched against a long-lived and determined hero with deep, dark secrets and vulnerabilities make for a tale to satisfy the tastes of most any reader. Kudos to author Marly Mathews for an excellent read which earns its place on the Keeper Shelf. Twilight's Kiss at Two Lips Reviews! I've recently signed a contract with The Wild Rose Press for my full length Arthurian Time Travel romance, My Lady Knight of Avalon. The blurb is below and the cover is coming soon! She was King Arthur’s daughter. Once known as Princess Mary Pendragon, fifteen hundred year old immortal warrior witch, Molly Pendleton is on a quest to stop time from unraveling into a dark and terrible future. With Merlin’s help she will time travel back to the golden age of Camelot and come face to face with someone from her future. He was the grandchild of her best friend. Collin Remington never dreamt that magic flowed through his veins or that he would become a knight of King Arthur’s court. With evil quickly taking the upper hand in King Arthur’s realm, Molly and Collin must fight against time itself. Will their love be enough to save the future? The Published Authors of RWA Online appearing at the TKA Chat Space! The chat will feature RWA Online authors published in the futuristic, fantasy and paranormal romantic subgenres. The chat will be moderated by RWA Online chat divas, Ellen Peters and Marly Mathews and our special guest moderator, Melissa Francis! Featured Interview with The Wild Rose Press at TRS! The Wild Rose Press was featured at The Romance Studio the other day in a wonderful interview. Check it out by following the link below! Twilight's Kiss Reviewed by Once Upon A Romance! 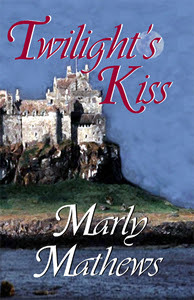 Twilight's Kiss has been reviewed by Marlene Breakfield at Once Upon A Romance! Huge thanks to Marlene for the wonderful review. Without futher ado, here it is! Bridget Sinclair travels to a Scottish village using her romance novel pseudonym, Bridie Sullivan. However, Bridget has a secret- she is really a faery, who has been trained to kill vampires and other evil creatures. When Bridget first arrives, she meets dark, broody, Sean Sutherland and their attraction is immediate. Sean, too, has a secret- he is cursed by a vampire sorceress to be a vampire until his true love saves him via a prophesy. Sean is a reluctant vampire and has fought off the evil nature of his vampire self for over three hundred years. As the lord of the village and surrounding lands, Sean has been his peoples' protector. Unfortunately, evil forces are planning on converging on Sean's land, which magnifies magic. Will Sean and Bridget be able to stop the evil hordes and will a vampire and a vampire hunter be able to find love? Ms. Mathews pens an exciting fantasy romance with charming secondary characters and a very stubborn hero and heroine. In fact, Sean and Bridget are so stubborn that, at times, I wanted to knock some sense into them. Sean did come around fairly quickly but Bridget is like a pitbull- she has trouble letting go of an idea. The fact that I wanted to force the characters to see the error of their ways shows how involved I became in their story. Poor Sean, is such a tortured hero, who has so many people depending on him and only love can save him. Bridget is very confused, because her duty is to destroy vampires and she finds herself falling for one. During all this emotional turmoil the evil vampire sorceress sets out to make sure Sean remains cursed and that she becomes even more powerful. Ms. Mathews produces an epic battle against good and evil and delivers a sigh-inducing ending. I recommend Twilight's Kiss to the reader of fantasy romance. Twilight's Kiss available at Barnes and Noble and Amazon! Twilight's Kiss is now available to order in print at Barnes and Noble and Amazon.com! Check it out!